The wool balls of our messy cat are all tangled in a big rolling ball, can you help him to tidy them up? Help him to put some order forming groups of wool balls of the same color until you untangle the whole knot! Use special wool bombs that will explode all the balls around it or the multicolour wool bombs that will remove all the balls of the same colour of the first one it touches! But be careful, the big rolling ball is rotating, don’t get dizzy! 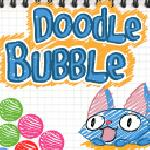 This Website is not affiliated with Doodle Bubble. trademarks are the property of their respective owners. Game content and materials copyright Doodle Bubble. all right reserved.